Slowing Down to Gear Up! When Kathleen and I are on the road, we’re ON THE ROAD. For the first few years we travelled, I liked to pretend that I’d actually get work done, taking my computer and knit projects with me wherever we went. It became pretty obvious, though, that time on road meant ROAD TIME, and although I’d squeeze out the odd new design, or blog post, the energy required to be present in classes and in the booth meant that our non-show hours were usually just recharging our batteries. This isn’t a bad thing, although at first I thought it was. Learning to accept that I have limited time and energy forces me to focus more intently on exactly WHAT is the most important thing for me to do. These past two weeks, the most important thing I needed to do was REST. Tomorrow I go back into the dye studio, although my assistant will be handling just about EVERY physical aspect of the work. I’m still a mass of pain, my chest burns with the Costochondritis and walking is still a bit painful from the accompanying sciatica. I’m hopeful that I’ll be able to use Layla (my assistant) to help me bridge the place from not being able to do ANYTHING to doing EVERYTHING myself. Asking for help is hard. Almost as hard as resting. I have to get better at doing both if I intend to do this rather physical job of yarn dyeing for the long haul! And – for what it’s worth – I HAVE been working on a new design idea or two during my self-imposed sitting time. Idle hands, and all that. And if I continue to recover as I have been, I’m hoping to be back on my bike sometime this week, just for a mile or so, just to get my muscles used to the feeling of riding. And I REALLY need some of that riding joy right about now! Our next show isn’t until August 17, so I have plenty of time to move slowly. 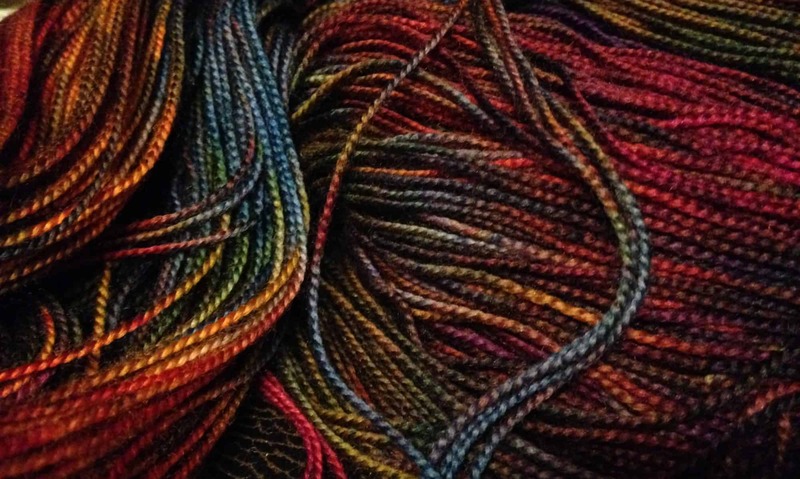 It’s the wonderful Michigan Fiber Festival, one of our favorites and it’s in Allegan, MI. Please do come by and say, “Hi!” if you’re in the area — you won’t regret it, it’s a LOVELY show! ModeKnit Yarn was on the road for most of June (the busiest month of our biz so far) but now we’re home. Huzzah. We will will rest until we go back on the road in August. Kathleen’s planning a short trip with her husband to visit a good friend in Seattle and I’m hoping to dye up a bunch of orders (with the assistance of the lovely Layla) and RESTING. And I am hopeful that I’ll be climbing out of this pit of pain called Costochondritis that I’ve fallen into*. On Mother’s Day this year, back in May, we had a booth at Shepherd’s Harvest in Minnesota and had an AMAZING show! Both kids came out to help me tear down and pack up the booth, and as helpful as they were, I still did something ridiculous and strained some muscle trying to catch a stack of gridwall that was sliding off of a hand truck. What started as a ‘back sprain’ has slowly consumed my ribcage in a conflagration of pain. Connected — although I’m not certain how — is a lower back pain which rivals anything I felt in childbirth*. For the record, Max was 11lbs, I used no meds except a touch of post-delivery demerol. Actually, when I think about it, I’m certain the whole pain mishegas had it’s conception in a fall I took at Target in late April on their icy sidewalks… Damn. Cycling, my panacea for pain, has been just outside of my grasp. Simply trying to climb onto the bike is torture, trying to ride to the end of our alley is Just. Too. Painful*. So now I’m in my recliner, waiting to see the doctor this morning, happy to have found a position where I can sit for 10 minutes*. For now, every breath, every movement, every time I bend to pick up something, I’m in agony*. This June was a sort of experiment for MKY — trying out 2 new shows, plus a LONG trip back to Colorado for Estes Park again. We loved being at all 3 shows, but I don’t think we can realistically do this again, not without some younger, stronger backs to help us on our way! Max accompanied Kathleen and I to Iowa AND to Houston, and if it weren’t for him I’m certain that we would not have been able to do either show. I know I wouldn’t have been able to. In many ways, this physical nonsense is a wake up call to K and me to take a good, hard look at our business model, and consider which parts are working well, and which aren’t sustainable continuing as we currently are. Lifting and carrying heavy things, even when my back and body are healed, is something to which I must bid a fond farewell as I ease into my sixth decade. Growing older doesn’t mean the business will slow, but it DOES mean we have to work smarter! *I know this is simply a blog post of complaining and whining, I’m so sorry. Back in Cool, Cool Minnesota! This evening I attended a small gallery opening where items from a class I took were displayed. It was a class in Rug Hooking, taken at my local Textile Center and taught by Rug Artist Mary Logue. The class was AMAZING fun, and I discovered things about myself, my design process, my color likes and dislikes, that I hadn’t expected to learn. And THAT is the best thing about a class, I get to learn a little bit more about ME! I don’t get to take as many classes as I’d like, but this year I promised myself that I would take at LEAST two classes in new subjects. In the Winter I took a class to learn to bake Scandinavian Christmas Cookies. In the Spring I took a class to make Glass Mosaics. The above piece was based on a photo I took while Kathleen and I were on a road trip and she was driving, a highway in Minnesota. I’ve found each of these classes to be so inspiring – and just FUN! It’s very helpful as a teacher to experience classes from the other side every now and then! I teach a LOT! I teach at many fiber shows, and sometimes at yarn shops and at knitting conventions around the country. I know that I enjoy my classes (the students are always such a surprise, and SO much fun!) but I tend to forget how great it is to just LEARN a new skill! This June I’ll be teaching at three different fiber festivals around the US. Perhaps you – or someone you know – would be interested in taking a class with me? I know I’d LOVE to have you in class! On June 7 & 8 I’ll be teaching 4 classes at Estes Park Wool Market in Estes Park, Colorado. Kathleen and I are also vending there, selling our yarn and making friends! The classes I’m teaching are Finishing, Combination Knitting, Knitting with Wire and Charted Entrelac. I know a few of my Estes Park classes are sold out, but I’ve also told the Estes Park folks that I can take a few extra students if necessary, so check out the classes and email them with any questions! We’re barely home before Kathleen and I climb back into the Pilot for the Iowa Sheep & Wool Fest, where I’m teaching a class on my popular scarf pattern, Backyard Leaves, on Saturday morning June 16. This is a great class for someone who feels she’d like to mistress charts, and learn about how lace can create wonderful shapes in a garment. I’m also teaching my favorite class, Combination Knitting on Sunday morning, June 17. It’s our first time at the Iowa festival, and we are PSYCHED to be at a landmark event so close to home! There are still spaces in both classes, you can sign up here! Finally, June 22-24 ModeKnit Yarn will be at the Houston Fiber Fest, and we’re SO excited for our first time at this great event! In addition to selling our wide variety of yarns and patterns, I’ll be teaching a LOT of classes. These include; Double Knitting, Knitting With Beads, CableMania, Combination Knitting, Mad About Plaid and Knitting With Wire. These are all exceptionally FUN classes, I really hope you’ll consider joining me for a delightful morning or afternoon! And, as always, Kathleen and I hope to see you in our booth for a visit and a piece of Tea Candy!